Read Our Award Winning Counseling Blog! Recently, Online Counseling Programs (an online company that connects future graduate school students to online Master’s degrees ), selected New Directions’ Counseling Blog as one of their top counseling blogs in 2017! Their review states “New Directions Counseling Services maintains this informative blog on healthy relationship-building, nutrition, psychotherapy, and women’s health. 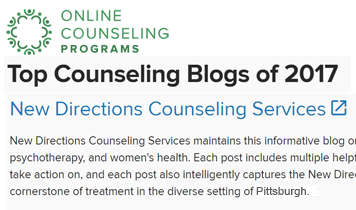 Each post includes multiple helpful takeaways for readers to think about and take action on, and each post also intelligently captures the New Directions Counseling Services’ capacity as a cornerstone of treatment in the diverse setting of Pittsburgh.” In addition, they recommend Deposit into Relationships and the Emotional Bank Account to their readers. At New Directions Counseling Services we believe in a comprehensive approach to your physical and mental health. Besides our nutritionists, psychiatrists and counselors, our top counseling blog is another way to provide you with the support you need. We hope you can take advantage of our warm staff, compassionate clinical team, and expert medical team. Change truly does begin here! By David Morris|2019-02-05T16:09:04+00:00June 12th, 2018|Stress|Comments Off on Read Our Award Winning Counseling Blog!